American-made wide mouth jar bands come 60 to a pack. They're much more convenient and economical than the small boxes that only hold a paltry dozen. Stock up! 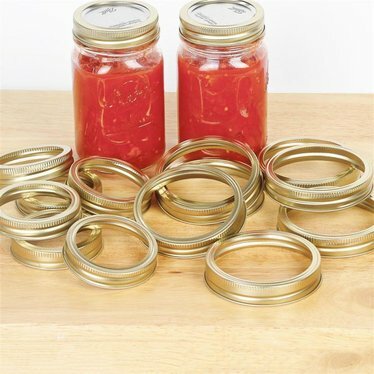 Note: These are not Ball® brand bands; however, they can be used on any standard canning jars and work just as well. Bulk canning dome lids available (sold separately). I was very pleased with the canning jar rings. They were needed in a hurry and even without special shipping they got here in plenty of time. They were well packed with no room for jiggling around or getting bent. It was nice to be able to get such a good amount for a reasonable price. I got my canning done with no problem. Thanks. These are great. I can't tell the difference between these and the ones that are with the ball canning lids. Very nice to be able to buy 244 lids and only 60 rings! Thanks.